One of my favorite things about the fall is being able to dress a little more cozy. The fall is almost here and I’m SO ready! I’m looking forward to throwing on a sweatshirt on a windy day or chilly night. I’m also not sure there are many things cuter than a baby in a sweat suit. Which brings me to my fall fashion highlight from Purl Lamb. 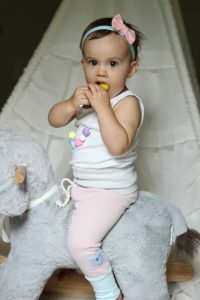 Purl Lamb has some of the most adorable and fun styles in sweat suits, rompers and sleepers. Tell me the little ears on her sweatshirt isn’t the cutest thing ever? She climbed on all by herself! Those little toes, I can’t believe they reach already! Interested in ordering but not sure what size to get? The sizes in the sweat suits ran true to size for us. Isabella is now wearing 12-18 months clothing and the 18 month sweat suit fit similar to her other clothes that are also that size. It was a breath of fresh air because that will make future ordering easy. As for shipping, they ship Monday-Friday SAME DAY as long as you order by 2pm! Not many shops tell you they ship same day! This instant gratification mommy loved hearing that! 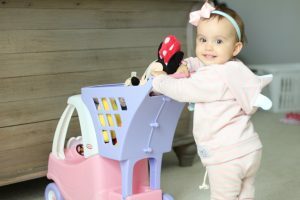 The sweats are perfect for your sweet little infant or an active toddler for needs lots of flexibility during the chilly days of the year. My wild child Izzy! The leopard print is fitting! Purl Lamb ships internationally so everyone has a chance to grab a pair, or two or three. If you see something you like you better order because once they are sold out, that’s it. It is VERY rare they bring back a sold out product. Ready, Set, Go Shopping! Here. Want a chance to win $50 shop credit? click here. I’d love to hear what your favorite sweatsuit is or would you mix and match? Those ears on top really are adorable! Babies in sweats are the cutest! Thank you, I think so too! I love the little ears! ? These little outfits are so adorable!! Babies in sweatsuits are the cutest thing on earth! This is exactly what I’m going to miss living in Florida. My kids will probably only wear warmer clothes for like a week. But I love the Crazy Dots outfit!! I think that needs to be my next purchase, I love that one too!